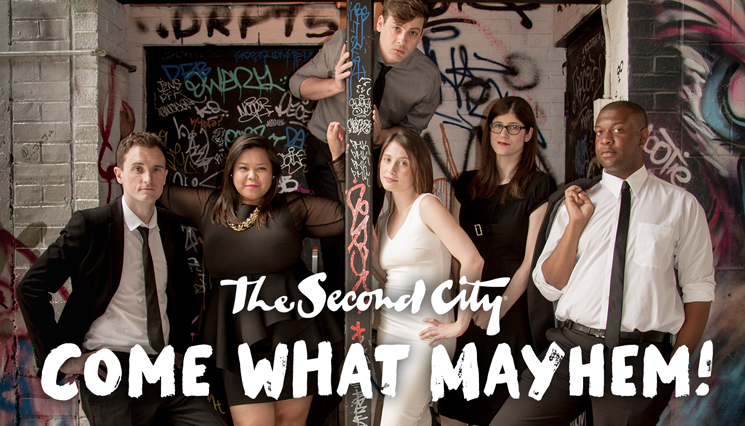 Featuring some outstanding new talent as well as some great returning troupe members, Come What Mayhem! is a brilliant blend of bitingly intelligent comedy with universal theatrical antics that caters to every sense of humour. No matter whether you love comically over-the-top musical numbers, incisive satire, or surreal snapshots that induce hard laughs in under 30 seconds, this show has a sketch to make you double over laughing at least once. One of the greatest strengths of Come What Mayhem! is its skewering of difficult topical issues in daringly unique ways. Notably, the troupe showed the ridiculousness of the transgender washroom controversy in a sketch where an alien called Crom ended up "depositing biomass" on the floor of a restaurant because the staff spent too long debating which washroom the extraterrestrial was allowed to go into. Better yet, Come What Mayhem! addressed fat-shaming through a sketch starring the always refreshingly hilarious Ann Pornel, where she tried to get her friends to admit she's fat without it being an insult. In addition, the Second City company's game show called "You Oughta Know!," hosted by the fantastically twisted Roger Bainbridge, was ingenious. By asking ditzy characters and a random man from the crowd to answer questions about ISIS, the military coup in Turkey and Cabinet of Canada, the audience was forced to recognize their own political apathy, but got to laugh through it. Brandon Hackett shone in this scene of his Second City Mainstage debut as he grinned brightly, then punished wrong answers from contestants with hilariously horrible things like ripping up and eating a cheque made out to a women's shelter. Amazingly, Come What Mayhem! is just as in its element with sketches intended purely for entertainment as it was with commentary on socio-political conflicts. A brief scene where someone put their ear up to a conch only to hear it groan "Help me..." in agony was one of the most hilarious moments of the night, plus their opening sketch where a woman lied to her boyfriend about whether she was pregnant to see his real reaction was shockingly funny. Moreover, the consistently wonderful songs included two characters admitting they were just singing because they needed to segue into the next scene, a man bragging about ordering a side salad instead of fries, and three musicians talking about being totally broke.